“This book is OUTSTANDING and a must-read/must-have! The Motivated Job Search is a culmination of Brian Howard’s 20+ years as a highly successful executive recruiter, career coach, and advocate. The book provides a step-by-step road map to help you proactively land the right opportunity or career change at the right time, no matter where you are in your life. Brian Howard speaks to the reader from an authentic, sincere, yet practical perspective and provides all of the tools to help you differentiate yourself in a competitive marketplace and get the job that you want. The Motivated Job Search is a practical no-nonsense guide to getting the job offers you want in the shortest time possible! Brian Howard provides a proven and systematic approach for conducting a real-world job search based on years of frontline recruiting experience helping thousands of job seekers find hidden job market openings, acing interviews, and winning job offers. The book gives you a distinctive competitive edge by teaching techniques that will make you stand out from other job seekers! As the most comprehensive job search guide currently on the market, The Motivated Job Search covers every necessary and meaningful topic involved in a job search, along with many not otherwise written about in other job search books. It promotes a self-motivated job search approach where you can take charge of your job search by proactively engaging the job market in various ways to discover hidden job market opportunities. The self-motivated approach teaches impactful ways to engage employers in meaningful communications leading to interviews that result in job offers! You can order the book on the publisher’s website, WriteLife Publishing or through Amazon. Motivated Resumes and LinkedIn Profiles is unlike any resume book ever written! It gives you unprecedented insight and advice from over a dozen of the most credentialed, experienced and award-winning resume writers in the industry. With over 188 pieces of sage advice quoted throughout the book on how to write a resume, you will learn how these writers create impactful resumes that stand out, get you interviews, and job offers! Get inside the minds of these resume writers. Learn how they think about keywords, titling, branding, accomplishments, color, design and a plethora of other resume writing considerations as they create winning resumes. Some say that Motivated Resumes and LinkedIn Profiles reveals too many secrets of the resume writing industry! So become an “insider” and learn from some of the very best. With over 80 sample resumes, 40 sample cover letters, and other job search written communications, you can view the works of these industry-leading resume writers in a portfolio format, learn about them, and even contact them if you choose to have your resume professional written. Brian Howard has created a book that surpasses all other resume books by tapping into the collective knowledge of the resume writing industry’s most experienced, credentialed, and award-winning resume writers. It happened. It may have been a surprise or it could have been anticipated but at this point what does it matter? You lost your job. Or, the frustrations at your current job have hit the boiling point. You just can’t take anymore! In either case, change is inevitable. But, you’re over the age of 50. Intellectually or intuitively you know your age could be a factor in your job search…and, you would be right. There are age-related biases that exist in the job market that will work against you. According to government statistics, job seekers over 50 encounter more difficulty in getting new jobs and suffer notably longer unemployment than their younger counterparts. But these statistics do not have to apply to you! First, immediately stop with the worry and negative thinking. You’re in a better position than what you think. There are employers out there that not only will hire you, they are looking for you! The key is to find them, sell them on you, and get them to hire you. And, it’s not as hard as you may think. In The Over 50 and Motivated book, Brian Howard will teach you a systematic approach for conducting a real-world job search based on years of frontline recruiting experience helping thousands of tenured job seekers just like you. He will teach you how to effectively conduct a job search in today’s job market and techniques to successfully combat age biases. He will show you how to get job offers and your next fulfilling career position! The Motivated Networker is a direct-to-the-point guide for networking during a job search. When 60% to 80% of all jobs are filled through some form of networking, mastering the skill of networking is imperative to success in landing a new job in the shortest time possible! Brian Howard provides an easy to understand and easy to execute approach for networking in a real-world job search. Based on years of front-line recruiting experience helping thousands of job seekers find hidden job market openings leading to job offers, the book gives you a distinctive competitive edge by teaching networking techniques that will create job leads, interviews, and a fulfilling career position! The Motivated Networker is part of a series of books starting with The Motivated Job Search, the most comprehensive job search guide currently on the market. The Motivated Networker provides networking techniques and insight not otherwise written about or discussed. It is a comprehensive approach for today’s job seeker who needs quick and direct guidance for effective networking during a job search. This book will shorten your job search! Job search expert, Brian E. Howard, has been helping job seekers for over 25 years. 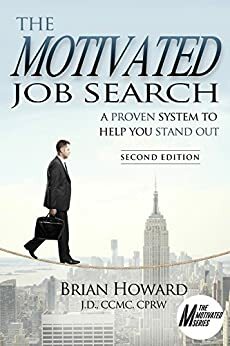 From that depth of experience, Brian wrote The Motivated Job Search Workbook which contains thought-provoking questions and exercises that correlate directly with Brian’s job search books, The Motivated Job Search and Over 50 and Motivated. Conducting a job search can be a daunting task, especially if that job search was put upon you unexpectedly. Thoughts and questions like where to start, what to do, how to deal with feelings, where to go for information among so many others can quickly overwhelm you and deflate your confidence. This workbook, used with The Motivated Job Search or Over 50 and Motivated will get you through it! It will lead you to your next job! With plenty of writing space, The Motivated Job Search Workbook, takes you through the step-by-step process of a motivated job search. The questions and exercises are simple but will make you think about yourself, your professional value proposition, your successes, your brand, and all of the practical action items you must do to successfully execute a job search. Written as a comprehensive workbook for the entire job search process, it will keep you organized, keep you thinking, and keep you motivated!